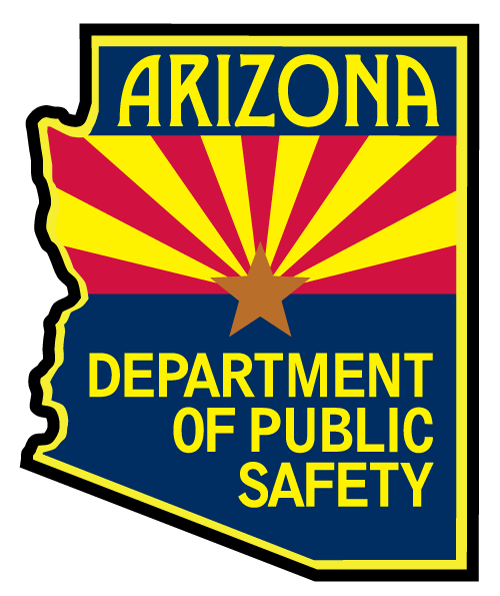 Each of the seven points on the Arizona Department of Public Safety, (AZDPS) breast badge reflects an exceptional quality associated with the Department's philosophy toward justice. In fact, each point represents a letter in the word "Justice" which serves as an acronym to describe something special to those associated with the state's top law enforcement agency. J -"Eleven o'clock" represents Justice. U -"One o'clock" personifies Undaunted commitment to law enforcement. S -"Three o'clock" denotes Service. T -"Five o'clock" stands for Trust. I -"Six o'clock" reflects Integrity. C -"Seven o'clock" represents Courtesy as embodied in the Department's motto of "Courteous Vigilance." E -"Nine o'clock" symbolizes Empathy. Retired ADPS Major Harley Thompson is credited with creating the framework of this acronym adopted by the Department. The badge on the Montana peak hat worn by state troopers of the Arizona Department of Public Safety was designed in 1941 by Pulitzer Prize winner Reg Manning, at that time a staff artist for The Arizona Republic, the state's largest daily newspaper. The hat badge's design is comprised of several symbols indicative of the state of Arizona. It contains representations of a saguaro cactus, a pine tree, a saguaro blossom (Arizona's state flower), mountains, a petroglyph of an eagle, an outline of Arizona's boundaries, the state seal and a Navajo sand painting rainbow symbol. The name "Arizona Highway Patrol" is also etched on the hat badge. 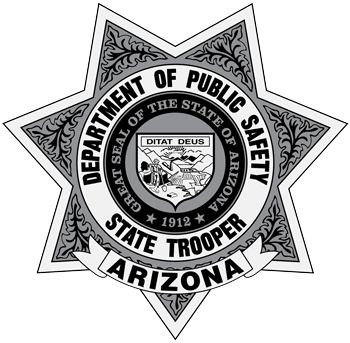 The state-outline patch worn by today's AZDPS troopers was designed by Richard E. Richardson in 1971, about two years after the Arizona Highway Patrol became part of the newly-formed Arizona Department of Public Safety. Although the color scheme remained the same, Richardson's design replaced the shield patch worn by the Arizona Highway Patrol. This flag with its unique design is dedicated to all Arizona Department of Public Safety employees of yesterday, today and tomorrow, especially to those troopers who made the supreme sacrifice in a valiant effort to preserve public safety. The field of blue in the flag reflects boldness and the Department's desire to serve. A golden horizon depicts AZDPS' broad scope of expertise and the Department's promising future. A saguaro cactus and a pine tree symbolizes ADPS' mission as a statewide law enforcement agency with responsibilities extending from the state's vast deserts to its highest mountains. The ADPS breast badge demonstrates pride in ourselves, our agency and our accomplishments. The agency's motto of "Courteous Vigilance" provides troopers with guidance and foundation. The flag's black border serves as a memorial for troopers killed in the line of duty. Designed by the Department's Silver Anniversary Committee, the AZDPS flag made its first official appearance on January 26, 1994, during the agency's 25th anniversary celebration at AZDPS headquarters in Phoenix.